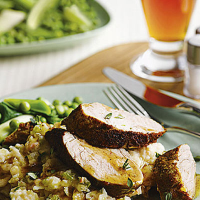 Warm slices of roasted lean pork with a Moroccan-spiced coating, are served on a bed of garlicky cannellini bean mash. Preheat the oven to 200°C, gas mark 6. Trim any fat from the pork and dust with a little salt and the ras el hanout. Heat 1 teaspoon of the oil in a small frying pan and sear the pork on all sides until browned. Transfer to a small roasting tin and roast in the oven for 20-25 minutes until the fillet is thoroughly cooked and there is no pink meat. Meanwhile, heat the remaining teaspoon of oil in the frying pan. Add the onion and celery, and fry gently for about 5 minutes until very soft, but not browned. Add the garlic and cannellini beans, and scatter with the lemon thyme. Cook very gently for 5 minutes until heated through. Add 3 tablespoons of warm water and crush the beans using a potato masher. Pile the bean mixture onto warmed serving plates. Cut the pork into chunky slices and arrange on the mash. Stir the honey into the juices left in the tin then spoon the sauce over the meat. Scatter with extra thyme. Serve with green vegetables, such as Waitrose Peas, Leeks & Spinach Medley. Ras el hanout – a Moroccan blend of dried spices – is Arabic for 'top of the shop'. If you have a good spice selection, you can make it yourself, using a blend of crushed coriander seeds, cardamom, allspice, nutmeg, cayenne and cloves. A fresh, hoppy ale with a clean, bitter finish would work well with the Moroccan spices in this dish.